At the Elizabethtown Area Regional Authority's meeting Tuesday morning, traffic engineer Steve Gault, who works for Mount Joy Township, presented a plan that would create a series of one-way streets around the Maytown Road-Market Street intersection and eliminate the traffic signal there. And the EARA board voted unanimously to authorize Gault to apply for a grant that could fund the project. Gault presented the proposal to EARA, which was formed last year to help implement a regional comprehensive plan that all four municipalities in the greater Elizabethtown area -- the borough and Conoy, Mount Joy and West Donegal townships -- approved last year. In meetings this year, EARA members made traffic issues identified in the comprehensive plan a priority. And specifically, they want to focus on the area from Maytown Avenue to Kmart. Gault has been working with EARA on traffic issues and brought his proposal to the board, saying it is one that is probably the most cost effective to complete. 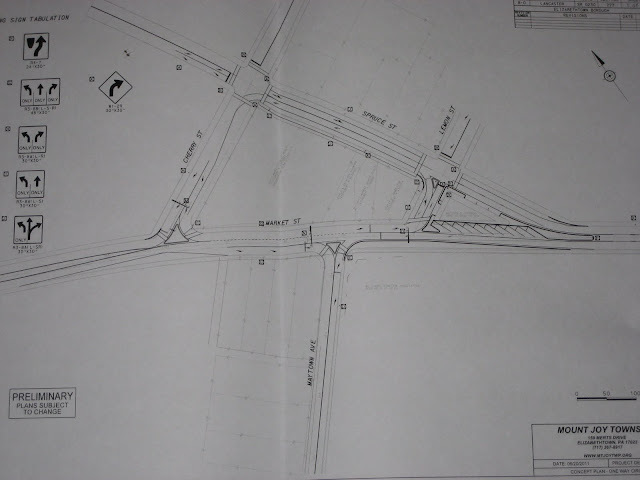 He compared the proposal to a roundabout that uses the existing streets. 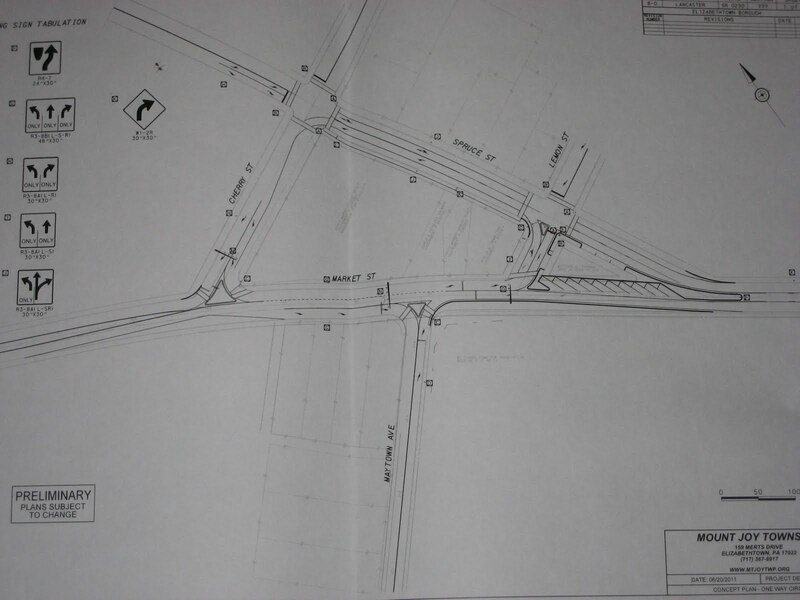 If approved as presented, the traffic light at the Maytown Road-Market Street intersection would disappear. Instead, traffic would flow one way south on Market, with drivers entering from Maytown only able to turn right with a yield sign. If they want to head north on Market, they will make a left onto Lemon Street, a left onto Spruce Street and a left onto Cherry, all of which also would be one way, and then turn right onto Market. Northbound drivers on Market coming from the Kmart and Giant areas would have to make that same maneuver. This idea is just a proposal right now. In fact, it is preliminary enough that Gault did not have cost estimates at the meeting this week. However, he said there is grant money available for which the project might be eligible -- and the EARA board voted to approve an application since it is due at the end of July. For the project to move forward, Borough Council would need to approve the concept and plans, and it would need approval from the Pennsylvania Department of Transportation. Dr. Dale Treese, who is chairman of the EAWA board and a member of Borough Council, said he he liked the plan. Likewise, I think this has some potential as well. On paper, it appears that it might work by keeping traffic flowing -- especially on Market Street during times of high volume. Any other improvements to the intersection, such as a new traffic light or reconfiguring it, would involve tearing down existing buildings. Treese said estimates for that kind of work and constructing a new intersection were at least $1.5 million several years ago. Assuming the project received approval from Borough Council, and the grant application is approved, Gault estimated that this would be two years before the project would be done. Seems completley unnecessary, not to mention a waste of money. Why filter all of that traffic onto smaller side streets like Spruce, Lemon and Cherry? Then you really will have a traffic jam. I have lived here for over 10 years and have never been more than mildly delayed from any traffic on Market. Thanks, Robert. This idea is at the very preliminary stage and requires lots of thought and discussion. At first glance, it seems like a workable solution to keep traffic moving and to calm traffic down, especially as it comes back into town from Kmart and Giant. My mind is not made up, but I'm glad to have presented the idea and to have generated some discussion. Maybe I am misunderstanding this, but from the plans, it looks like if I come into E-town on Maytown Rd. (which I often do) - I would be forced to go right on Market? Then I would have to find somehwere to make a U-turn, or double back to go into town? As drawn, the plans would have all traffic from Maytown Road turn right onto Market. Drivers that want to head downtown would need to turn left on Lemon Street, left on Spruce and left on Cherry to get back to Market.